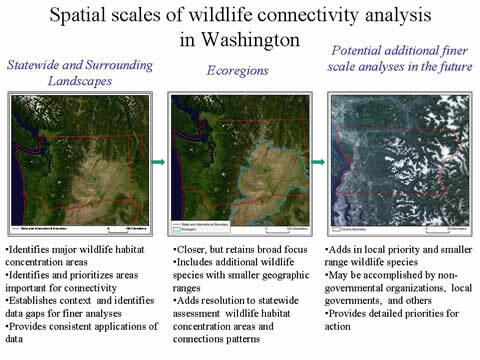 The goal of the Washington Connected Landscapes Project is to provide a series of scientific analyses and tools that use the best available science to identify important wildlife habitat linkage areas in Washington State and neighboring habitats. First, we have analyzed connectivity at a statewide scale in current conditions. We are following this initial analysis with finer scale analysis at the ecoregional level such as we did in the Columbia Plateau. In some cases, as with the transboundary region with British Columbia we are exploring the most appropriate scale for analysis to meet the needs of practitioners and resource mangers in the region. One new approach was captured in our Okanagan-Kettle subregional connectivity assessment in the transboundary landscape. At all scales we are analyzing anticipated shifts in habitat conditions impacting habitat connectivity over time with climate change. Additionally, analyses at every scale is ideally informed by field research and has a built in plan for model validation.